The 3-Colour Prestained Protein Marker is a mixture of twelve pre-stained proteins minutely selected to facilitate protein molecular weight estimation across a wide range, from 10 to 245 kDa. Proteins are covalently coupled with different colour dyes (green: 25 kDa, red: 75 kDa and blue: 10, 15, 20, 35, 45, 60, 100, 140, 180, 245 kDa). A model of proteins’ molecular weight for 3-Color Prestained Protein Marker II is a mixture of carefully selected 10 stained, proteins within a wide range of masses (10 –180 kDa). 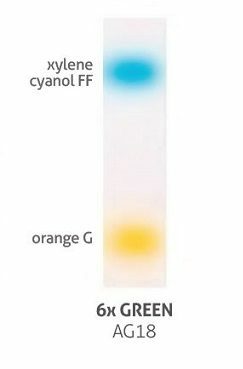 Proteins, the marker consists of, are covalently bonded with colored dyes: green (25 kDa), red (75 kDa), and blue 10, 15, 35, 45, 60, 100, 140, 180 kDa). The Marker is ready to use and does not require any additional prepartions before it is transferred to the wells in a polyacrylamide gel. The HR Agarose is suitable for the separation of small DNA fragments and PCR products of between 20 – 800 bp. 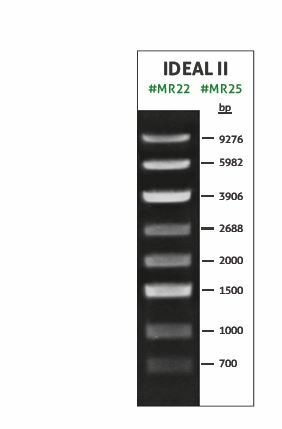 The HR Agarose allows the separation of DNA fragments differing by a molecular weight of 2% and provides a good alternative to polyacrylamide electrophoresis. In addition, HR Agarose has an excellent clarity of gels at a concentration of as high as 5%. 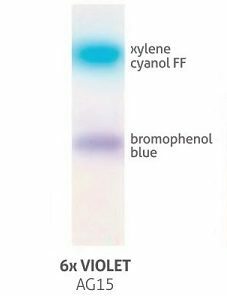 This provides electrophoresis results of a very good clarity. The melting and gelling point of the agarose have lower values when compared to LE Agarose Standard and are higher than LM Agarose Low Melting Point. A model of proteins’ molecular weight for Blue Prestained Protein Marker is a mixture of carefully selected 10 stained, proteins within a wide range of masses (10 –180 kDa). Proteins, the marker consists of, are covalently bonded with the blue dye. Two reference fragments are (25 kDa and 72 kDa) more intense during SDS-PAGE electrophoresis (buffer Tris-Glycine). The Marker is ready to use and does not require any additional prepartions before it is transferred to the wells in a polyacrylamide gel. 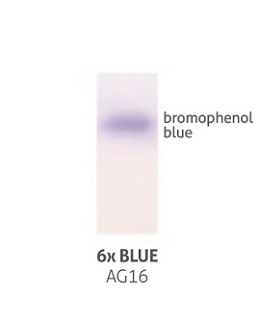 The 6x BLUE DNA Loading Buffer products facilitate the loading of DNA on agarose or polyacrylamide gels. The buffers are concentrated by a factor of six, so in order to obtain the best results mix 2 μl of the loading buffer with 10 μl of the DNA sample. The loading buffers contains Ficoll® 400 (6x BLUE), which facilitate rapid sinking to the bottom of the well in the agarose or polyacrylamide gel. 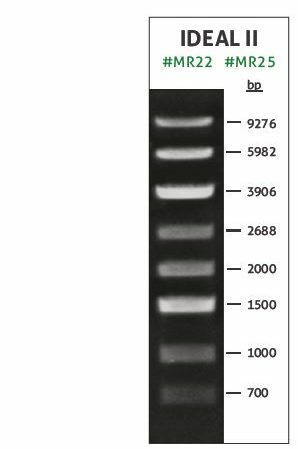 The 6x GREEN DNA Loading Buffer products facilitate the loading of DNA on agarose or polyacrylamide gels. The buffers are concentrated by a factor of six, so in order to obtain the best results mix 2 μl of the loading buffer with 10 μl of the DNA sample. The loading buffers contains Ficoll® 400 (6x BLUE), which facilitate rapid sinking to the bottom of the well in the agarose or polyacrylamide gel. 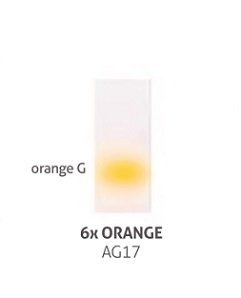 The 6x ORANGE DNA Loading Buffer products facilitate the loading of DNA on agarose or polyacrylamide gels. The buffers are concentrated by a factor of six, so in order to obtain the best results mix 2 μl of the loading buffer with 10 μl of the DNA sample. The loading buffers contains Ficoll® 400 (6x ORANGE), which facilitate rapid sinking to the bottom of the well in the agarose or polyacrylamide gel. The 6x DNA Loading Buffer products facilitate the loading of DNA on agarose or polyacrylamide gels. The buffers are concentrated by a factor of six, so in order to obtain the best results mix 2 μl of the loading buffer with 10 μl of the DNA sample. The loading buffers contains glycerol (6x VIOLET), which facilitate rapid sinking to the bottom of the well in the agarose or polyacrylamide gel. The LE Agarose Tablets are pre-weighted tablets of LE Agarose Standard suitable for routine electrophoresis. They provide a convenient, easy-to-use and time-saving solution. Each tablet of 0.5 g agarose is ready to dissolve in the previously measured 1x TAE / 1x TBE buffer. LE Agarose Tablets is used in particular for the routine electrophoresis of a wide range of DNA fragments (100 – 25.000 bp).